Hello all, Red Diamond here with another game review. 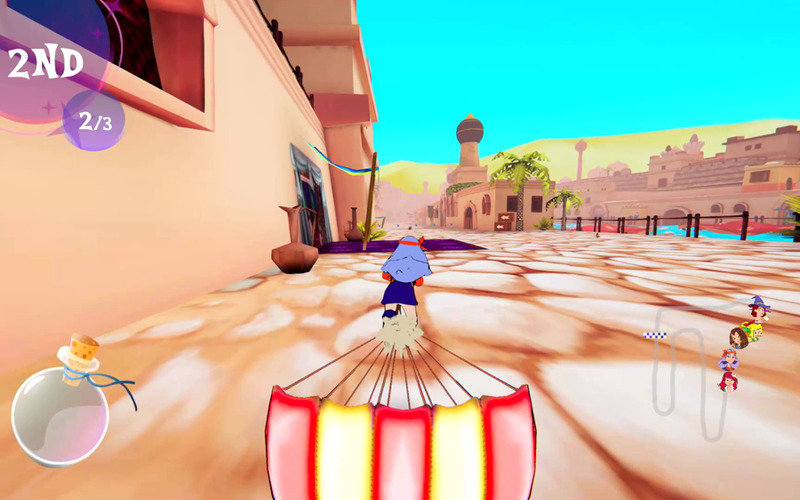 This time around we have got a cute little witch racing game in the same style as games like and Sonic and SEGA All Stars Racing and Mario Kart. BiBi and her witch friends decide to have some races just for the stake of a good time. Is it a good time? Hopefully it was fun for the characters because it is a big bowl of bland brand for the players. Click "read more" for the full review. The story is about as simple as it could be. Bibi and her friends have some time off school but all their parents are too busy to go on holiday. So, Bibi gets the idea to have series of races through different eras in time from Transylvania to the Dinosaurs. And that's it! After this introduction, the only bits of story to follow are to introduce new worlds and say goodbye to them. Three minor subplots happen with each world from a test of bravery, to competing for a genies wish, and chasing a runaway dinosaur egg. Nothing comes of these sadly; they are all resolved easy. 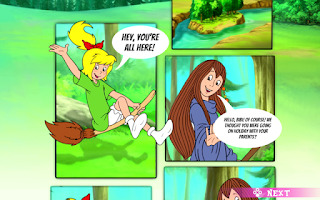 Cut scenes are still image comic strips that scroll with text that appears and disappears. One of these play at the beginning of the single player campaign and another at the beginning and ending of each of the 3 worlds. It does not matter who you play, the story and cut scenes remain unchanged. Sadly it is actually a missed opportunity, different outcomes might have given this game some replay value. Between the lack of voice acting and little movement, these scenes are not engaging and very forgettable. To describe the game play for this game in one word, it would be stock. Controls feel outdated. It uses a face button for accelerating rather than a trigger which can wear on the thumb fast. At least steering feels appropriate and drift boosting adds some skill. 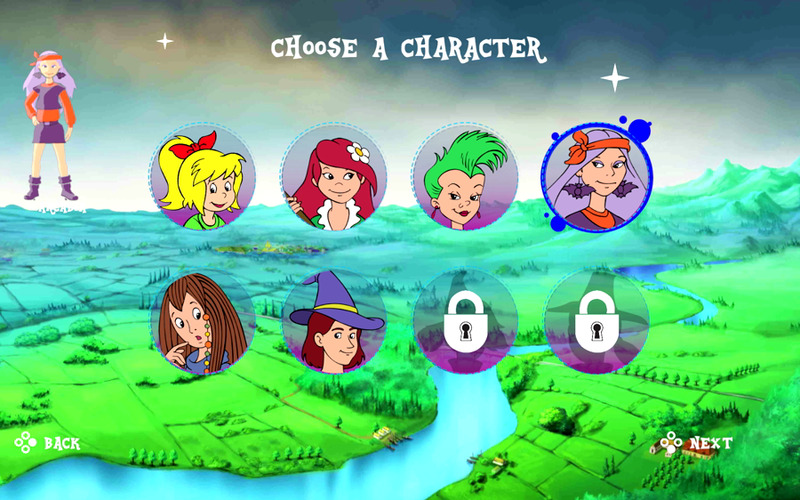 The single player story mode known as Witch Rally is very short. Three lap races inside 3 worlds each with 4 tracks. Completing them all unlocks 2 more worlds each with only one track each but only for the free mode. 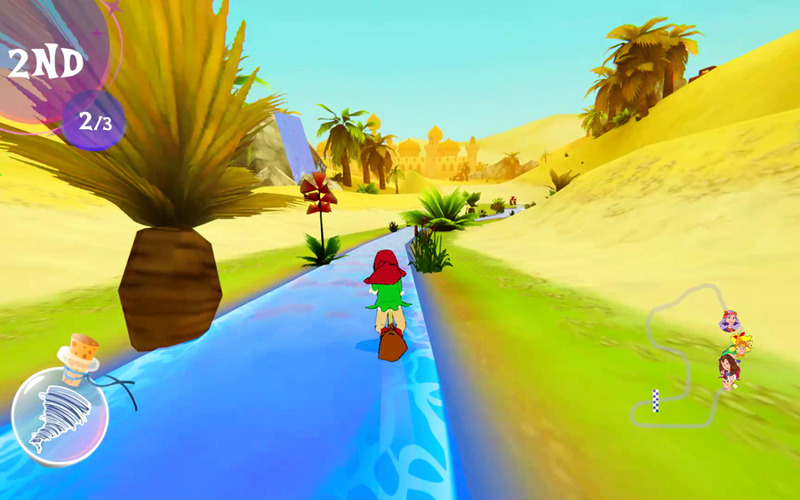 Other unlockables include time trials (as standard) and playing courses in reverse. 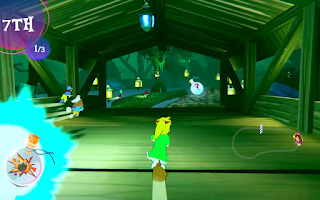 The biggest one being more playable character and different broomsticks. Sadly, this is ultimately rendered worthless as every character feels the exact same and only look different. On top of that, the differing stats on the broomsticks don't change things enough to be noticeable. Races feel slow but not dragged out. Movement speed in not very fast when not using a boost pad. But, it does not take long to finish races and the courses are easy enough to follow. One positive note is the change routes that happen from lap to lap keeps races from feeling repetitive. 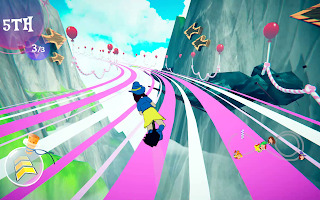 However, there is a constant feeling of disbelieve as your racer reacts to the tracks terrain despite flying over it. Some curious mechanic choices as well. Flying over water speeds up the racers. 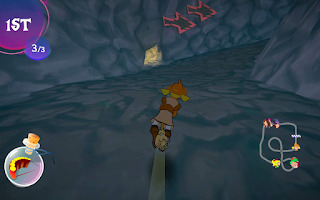 There is also a very odd ability where flying behind another racer for a few moments earns a boost. Invisible walls are everywhere eliminating any threat from narrow paths. 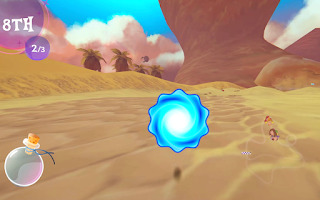 Power ups come in the form of potions that give spells and there is not a lot of variety here. 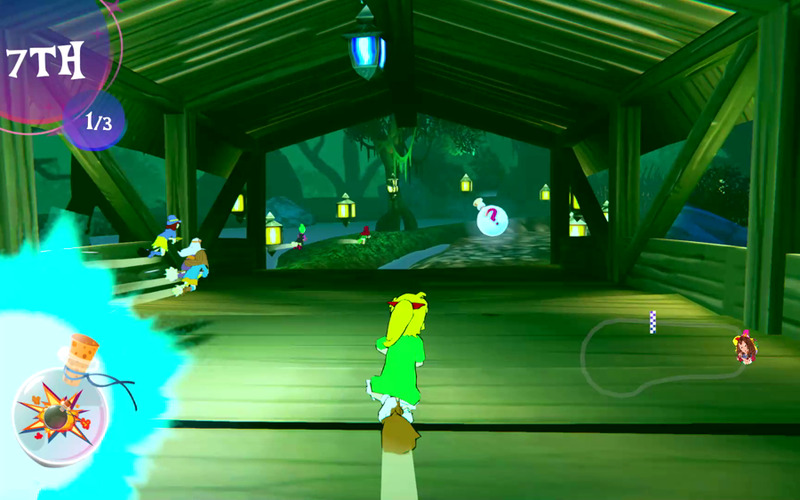 About 8 spells were present; they covered all the basics of kart racer attacks, traps, and speedups found in most kart racers. 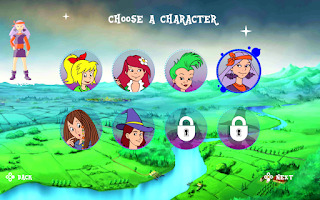 The spell theme fits the witches perfectly and their is a cute animation of casting a spell when one is used. 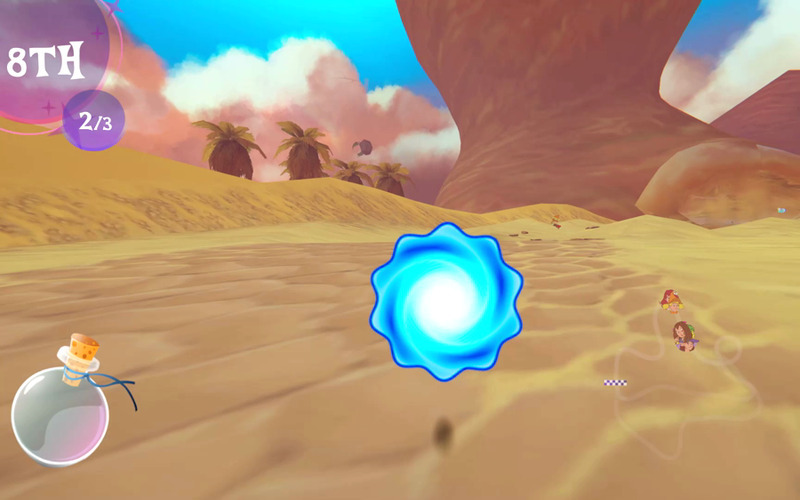 But, the one that makes the most serious impact on results is the chain chomp vortex that auto runs and makes the user invincible. It can only be found to someone in last place and can quickly push a racer to first. This is rarely needed though. Other than a select few courses the game is very easy. There is no difficulty setting to compensate this either. Stages that are mostly narrow paths are fairly challenging; sadly there were only a few in the game. Most of the time, victory comes less than close. As a whole the game play is underwhelming. It is functional, with no trouble running or major glitches (except one in a bonus track). But, the originality and lack of variety complemented by the short campaign make it an experience equivalent to eating plain bread for dinner. As mentioned, there is no voice acting in the game but the soundtrack is not bad. Tracks fit the stages and the jingle played over menus works well for the genre. Can't say there is any stand out track or ones that will be super memorable. But, for what it is, the music is cute and strong enough to fit. Sound effects are nothing worth discussing except maybe the constant whistling sound from your broomstick which gets a little annoying. There really isn't much to say on the matter beyond that. The music is passable but nothing special, sound effects are fine, and no voice acting is a bummer but means that subject ends there. 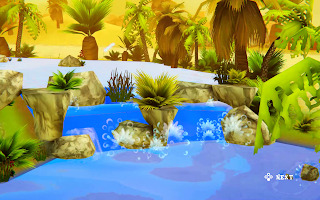 Complimenting the mediocre gameplay, the graphics are not good. There is no shortage of up-skirt shots from underage girls but plenty of shortages when it comes to details. The cute factor wears off fast when it is accompanied by unimpressive visuals. It has a very cartoon like feel and there are cases of 2D sprites being used similar to how 5th generation game consoles did. 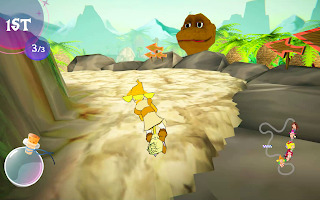 Even uses silly faces in certain places similar to what N64 3D platformers seemed to love. Level structure is a least pretty decent. It is always pretty clear where the path leads and their is some variety with terrain. These include, but are not limited to, a sand tornado, a cave turned into a lava pit, and some pretty majestic designs for the two bonus track. It is just too bad one of them glitched to where I was stuck in 5th place due to how it loaded the maps circling. 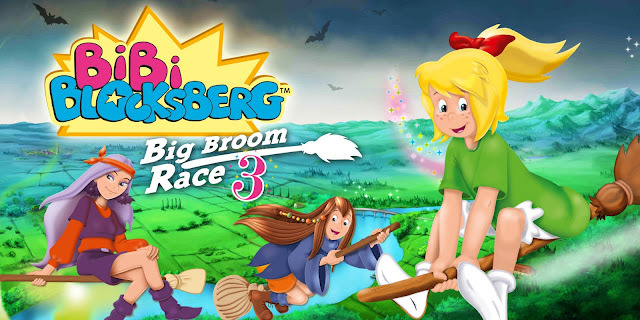 Bibi Blocksberg Big Broom Race 3 can be distributed as babies first kart racer. Everything is just okay. The game is not nice to look at and the story isn't worth anything beyond the bare minimum are explanation, but it is mildly fun to play. The whole Witch Rally campaign can be completed in less than an hour and a half and multiplayer might be fun if only for a good laugh. Given the relatively high price tag it is difficult to find an audience to recommend this title too. However, if I must, I'd recommend this title for either die hard Bibi fans or for parents of real little kids who cannot handle Mario Kart's difficulty yet.